First Day Of Camp seems way too silly to be substantive, but “Electro-City” manages to have it both ways. Maybe “substantive” is the wrong word, but it’s safe to say “Electro-City” is unexpectedly affecting. Take for example the flatulent romance between Andy and Katie. The line “Remember when I farted on you and made you fall in love with me” shouldn’t work as more than a joke. But somehow it does, as do all of the emotional beats of “Electro-City,” an episode that manages to feel like a character-driven television episode rather than merely a chain of tiny, goofy jokes. But there are plenty of tiny, goofy jokes too, which makes “Electro-City” a near-ideal blend of First Day Of Camp’s occasionally incompatible instincts. Paul Rudd goes for broke as usual, but something about his temper tantrum with Katie—in which he ever so slightly mispronounces “filet mignon”—is especially hysterical. Andy and Katie realize at the show’s climax that there’s only so long you can pretend to be the ghost of a wrongly executed man in love with his lawyer before the feelings become real. 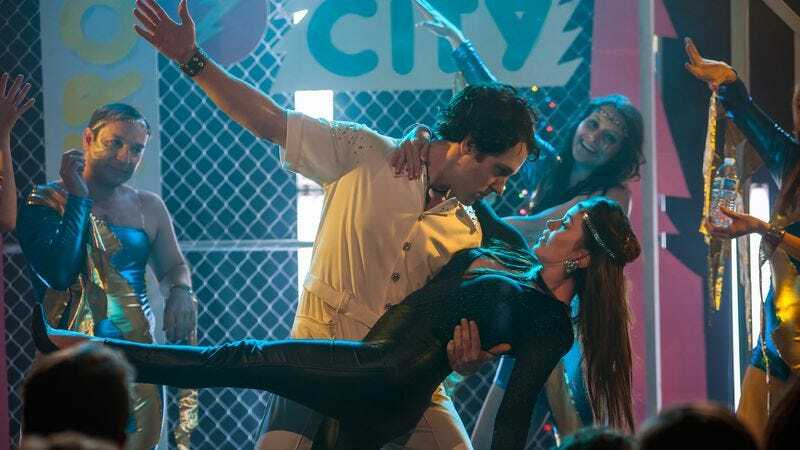 It’s no huge surprise that their relationship reaches an emotional peak with the performance of Electro-City, which has its own traditional narrative arc, as such a big chunk of the episode. The end of Ben and Susie’s relationship comes as more of a surprise, with Ben finally discovering his feelings for McKinley after their rousing performance of “Zoot Suit” and confessing to Susie as she’s confessing her dalliance with Claude Dumet. The mutuality of the revelations suggests Ben and Susie will be able to make a clean break, but when she learns that her affair with Claude was a youthful mistake while Ben has actual feelings, she can’t help but feel hurt. I genuinely felt sorry for Susie, even as much as I wanted Ben and McKinley to finally figure their situation out. There’s no emotion that can’t be accomplished with a bit of wistful piano music. Piano accompaniment also plays a major component in the budding relationship between Lindsay and Eric, who join forces to unlock his proto-punk genius lest he spent the rest of his life as Brian Wilson circa Smile. Or, for that matter, there’s no emotion that can’t be accomplished with a rousing song of triumph like the one used to score Jim Stansel’s victory over Xenstar. Some jokes in the WHAS universe never stop being funny, and one of them is the show’s totally skewed sense of time, space, and the ability of humans to process electronic data. The Xenstar trial braids those elements together brilliantly, and again, somehow ends up at an emotional climax. Just when Jim Stansel has finally shaken off his Johnny Piss Pot image, he meets a tragic end when The Falcon assassinates him, then takes out Greg for good measure. As jarring as it was to start “Dinner” without picking up with Beth and Greg as The Falcon was pursuing them, it wound up being a shrewd choice. With so many stories, most of which could be potentially dropped with little to no consequence, David Wain and Michael Showalter were able to drop a huge element and have the audience genuinely forget about it before it’s reintroduced later. This might be the first time watching First Day Of Camp as discrete installments actually enhanced the experience rather than just being super frustrating. I think I’m gonna like it here! Another hilarious play on the elasticity of time in the WHAS universe is Gail and Jeff’s run-in with Gene. Gail: “Oh, this is my husband Jeff.” Gene: “Hey Jeff, yeah, we met at the wedding earlier today.” That was another scene that shouldn’t have been affecting. I loved Andy’s bedazzled-bumpkin overalls in Electro-City. McKinley’s “Visor Man” improv bit was pure genius.